Sprouts – the wonder food. Grains : Wheat, maize, ragi, bajra and barley. 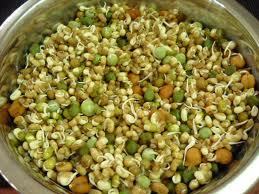 Seeds : Alfalfa seeds, radish seeds, fenugreek seeds, carrot seeds, coriander seeds, pumpkin seeds and muskmelon seeds. Legumes : Moong, Bengal gram, groundnut, kidney beans and peas. Each type of sprout has its own specific health benefits, but they all contain a much higher concentration of nutrients than found in their more mature forms. Sprouts have long been touted as a health food, but in addition to being full of nutrients, studies now show that they may also be effective in protecting and curing the body from disease. Here are 5 health benefits of sprouts. The high concentration of plant compounds (phytochemicals) found in sprouts are shown to give them both preventative and curative abilities when it comes to treating cancer and other diseases. Additionally, one study found that eating about 100 grams of sprouted vegetables every day protected against DNA damage, which is often associated with cancer risk. Spouts have high levels of antioxidants, which protect the body from DNA damage, promote cellular health, and boost the immune system. Sprouts are cholesterol free but high in protein and other nutrients and therefore a great alternative to cholesterol heavy foods. Sprouts are high in fibre, which helps a person maintain a healthy weight. They are also a great source of protein and therefore a great alternative to fattier proteins such as meat or cheese when a person is on a diet. The many antioxidants active in sprouts are thought to fight the effects of aging, both inside the body and out.